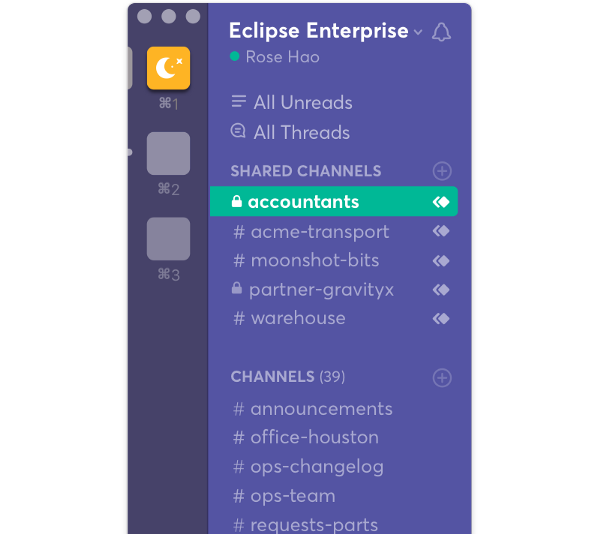 Last September, we launched a feature called Shared Channels (beta) — a new kind of channel that can live on two different workspaces, enabling separate organizations to work together in Slack. Over a third of our paying customers have already joined the beta, using shared channels to coordinate with their vendors, plan with their agencies, and provide service to their clients. By default, shared channels were public so members could view and join the shared channels on their respective workspaces. But sometimes you need a bit more privacy. You can now use private shared channels for conversations with your partners that may be more sensitive or include classified information. Like with regular private channels, members will need to be invited to view or join a private shared channel, and content won’t be surfaced in search results to non-members. Admins can choose whether a specific shared channel is public or private for their respective workspace. This means that a shared channel can be public or private on both workspaces, or public on one side and private on the other. For example, a shared channel discussing a potential merger may be private for both workspaces. On the other hand, a channel in which a company and its PR agency are discussing an upcoming launch may be kept public for the company but private for the agency’s workspace to limit the news to the account team involved. Just as with channels inside your organization, we recommend using public shared channels whenever possible for visibility and shared knowledge. That context can be useful later on — for example, if a colleague needs insight into a customer relationship or vendor agreement, they can find that information easily in Slack. *Admins will not be able to view the name or content of any private shared channel that they are not a member of, but can stop sharing them as needed. With shared channels in beta, we’re still working on improvements and will continue to roll out new features as they’re ready. We’d love to hear from you — please share feedback and let us know how you’re using shared channels by typing /feedback into Slack. Learn more about private shared channels and beta functionality in our Help Center and keep track of any updates on our changelog. Shared channels (beta) are currently only available for paid teams on Standard and Plus plans; Enterprise Grid support will be coming soon.